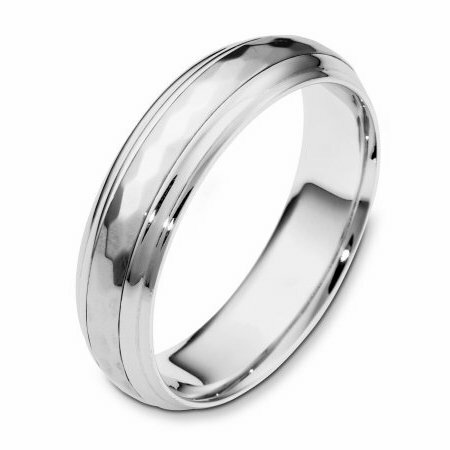 I just received a wedding band that I ordered from this web site. My future husband and I are bikers and he wanted something different for a wedding band. We checked all the Harley sites and found nothing we liked. I found what I was looking for one here. I was very scared and hesitant at first after all it was a lot of money for something I was not seeing before paying for it. I also wanted a message engraved on the inside for him and had read horror stories about engraving and how poorly they were done. I just received the ring today and I am here to tell you it is everything I could have hoped for and more. It is perfect and gergeous! The engraving I was so worried about was just as perfect as the ring. I would give this business 2 thumbs up and a perfect 10! Thank you for helping make my future wedding so perfect! ?? We recently purchased a handcrafted wedding band in 14K White Gold Polished and brushed braided combination. It is absolutely beautiful and my fiance is looking forward to wearing it proudly. Thank you!